Over 3.6 million people are under probation supervision in the U.S., and in most states, they are charged a monthly probation fee. The problem? Many of them are among the nation’s poorest, and they can’t afford these fees. From our previous research in Massachusetts – and from reports from around the country – we know that the burden of probation fees often falls disproportionately on the poor. To determine the extent of the problem nationally, we examined the incomes of people on probation in a recent survey, the National Survey of Drug Use and Health. Our analysis confirms that, nationwide, people on probation are much more likely than people not on probation to have low incomes. The National Survey of Drug Use and Health (NSDUH) is an annual survey that asks respondents about a broad range of topics, including their annual income and whether they were on probation in the past 12 months. The inclusion of recent probation history in the survey makes it a valuable data source for criminal justice research; it comes closer than any other source to offering a recent, descriptive, nationally representative picture of the population on probation.1 Prof. Michelle Phelps of the University of Minnesota, for example, used this survey in her recent analysis comparing people on probation to those in prison, using educational attainment as a measure of economic status. People on probation are much more likely to be low-income than those who aren’t on probation, and steep monthly probation fees often put them at risk of being jailed when they can’t pay. For a more detailed comparison, see the Appendix table. Nationwide, two-thirds (66%) of people on probation make less than $20,000 per year. Nearly 2 in 5 people on probation (38%) make less than $10,000 per year, well below the poverty line. On the wealthier end of the spectrum, few people (9%) on probation have annual incomes of $50,000 or more, while more than a quarter (28%) of those not on probation make at least $50,000 per year. Monthly probation fees may be just one of several fees that someone on probation has to pay regularly. As part of the conditions of their probation, an individual might have to pay court costs, one-time fees, monthly supervision fees, electronic monitoring costs, or any combination of these charges. Sometimes the law strictly defines the cost of these fees, and sometimes “reasonableness” is the only statutory guideline. Depending on the state, courts, departments of corrections, sheriffs’ departments, and the probation programs themselves can all collect revenue from these fees. Even though the Supreme Court has said it is unconstitutional to incarcerate someone because they cannot afford to pay court ordered fines and fees, many courts effectively do just that. Judges often fail to consider the individual’s ability to pay (as opposed to their willingness to pay) and treat nonpayment of fees as a violation of probation. This flies in the face of many state statutes that allow incarceration only when there is evidence that the individual is able to pay but refuses.2 As a result, poor people on probation face a very real risk of being incarcerated because they can’t afford monthly fees. As the National Criminal Justice Debt Initiative shows, many state laws amount to “poverty penalties” and “poverty traps” and failure to pay can mean an extended probation sentence, driver’s license revocation, mandatory work program, or incarceration. *In Massachusetts, the fees have two tiers, $50 for administrative and $65 for supervised probation. In Oklahoma, there are two separate monthly supervision fees, one up to $40 and another up to $20. **Due to the small number of NSDUH respondents in Maine and South Carolina who were on probation at any time in the past 12 months, the survey does not make the necessary data available for those states as part of NSDUH’s efforts to protect respondents’ identities. Such high fees – and high stakes – defeat the purpose of probation. In theory, probation (often touted as an “alternative” to incarceration) allows people to continue to work and manage family responsibilities while under supervision. But people faced with unaffordable fees are more likely to violate the conditions of supervision, experience housing and food instability, and struggle to support their children. And when failure to pay is treated as a violation of probation, individuals can be incarcerated, have their probation extended, and/or lose public benefits like food stamps and supplemental security income. On average, people under supervision could only pay about half of the imposed fees; at the end of their supervision term, the average person still owed 48% of their supervision fees. Louisiana’s probation system creates impossible debts that unfairly burden poor probationers. As in many states, failure to pay can lead to license suspensions, extension of supervision terms, and incarceration. As long as probation sentences include unreasonable fees and harsh punishments for failure to pay them, probation will continue to punish people just for being poor. Some states have begun to implement reforms to reduce the unnecessary incarceration and other unintended consequences of their probation fee systems. But as our analysis shows, this is a widespread problem that every state imposing probation fees should address. States must acknowledge that people on probation are mostly low-income, and driving them further into poverty through monthly fees is cruel and counterproductive. The Mass. Senate is considering building a new women's jail. We offer a number of reasons why this is a bad idea. The Massachusetts Senate is once again considering construction of a new jail for women in Middlesex County. But I would caution against any expansion of correctional facilities without first reckoning with the inherent harms of jail incarceration and exploring better alternatives. The proposal – Senate 1851 – would “establish a commission to identify a suitable location for a justice complex” in Middlesex County. I find it interesting that the commission is to identify a location, rather than consider whether a jail is needed at all. According to the text of the bill, this proposal is in line with a law passed in 2008 to expand jail capacity. But that law was passed in the wake of the state’s highest-ever rate of jail incarceration; since then, the state’s jail rate has seen a steady decline. This begs the question: why would the state need more capacity, when jail rates are down? The Vera Institute of Justice’s Incarceration Trends tool shows that jail incarceration rates in Massachusetts have fallen over the past decade. Despite the overall downward trend in the state’s jail rate, two groups have been jailed at steady or increasing rates: women and people being detained pretrial – and these are the two populations being used to justify the “need” for a new jail. The Vera Institute of Justice’s Incarceration Trends tool shows that the female jail rate in Massachusetts has risen steadily since the early 1990s. The pretrial population in Massachusetts jails has increased for decades, while the number of people serving sentences there has fallen dramatically since 1993. But despite the growth in the female and pretrial jail populations, there are some important arguments against building a new jail to hold these groups. First, jails are uniquely harmful to women, and their needs are better met by community-based programs and services. Women in jails have higher rates of mental health and substance use disorders, and often have a history of abuse or other trauma; incarceration more often exacerbates these problems than alleviates them (for more information, see the “Context” sidebar in our 2018 report). As of December 2018, the Massachusetts Department of Corrections (DOC) reported that “74% [of women held by the DOC] were open mental health cases, 15% had a serious mental illness (SMI), and 56% were on psychotropic medication” – all rates roughly double those of the male population. Women in jails (especially women of color) are also poorer, on average, than their male counterparts, and therefore often are detained pretrial because they can’t afford even low bail amounts. Furthermore, separation from children leads many women to accept plea deals just to get out of jail sooner, which in turn leaves them with criminal records that may not reflect actual guilt or innocence. Second, pretrial detention leads to worse outcomes, from high risk of suicide to increased likelihood of conviction, longer sentences, and reoffending. Yet pretrial detention has driven all of the jail growth in the U.S. over the last 20 years, which means that jails – like the one being proposed – are being built because more people who have not been convicted and are legally presumed innocent are being locked up. This trend reflects an increasing reliance on money bail – essentially, wealth-based release decisions – rather than an increase in “dangerousness” or flight risk. According to DOC data, the female pretrial population held by the DOC has increased 18% since 2010. If Massachusetts wants to relieve jail overcrowding, it should start by minimizing the number of people held pretrial, especially those who are there because they can’t afford bail. Another problem that should be addressed before expanding jail capacity is the racial disparity evident in the state’s female pretrial population. As of Jan. 1, 2018, nearly a third (32%) of the women held by the DOC (in Framingham) were being detained pretrial. However, this proportion varied by race and ethnicity. 44% of Hispanic women and 35% of Black women held by the DOC, versus 31% of “Other” and 29% of white women, were held pretrial. The idea to build a new women’s jail is not a new one. For years, a handful of Massachusetts counties have sent women detained pretrial to the women’s prison, MCI-Framingham, because they didn’t have separate jail space for women in the county jails. And for years, MCI-Framingham was overcrowded for precisely that reason. In 2007, the state opened a new jail for women farther west, and sent women from counties without separate women’s facilities that were west of Worcester to the new jail to await trial or serve their sentences. The result? Women jailed there were farther from crucial contacts, including their families and children, and their lawyers – which in turn made it harder to prepare their defense. Now, lawmakers want to build again, this time near the existing Framingham facility in southern Middlesex County. The legislators behind the new jail project undoubtedly see a new jail as an “upgrade” for the state’s incarcerated women, since it would alleviate crowding and would be more updated housing than the nearly 150-year-old prison. But the real solution for women in jails would be to return to their communities. They would be better served awaiting trial at home, participating in diversion programs, and getting needed treatment and support for underlying problems through community-based programs. If legislators care about improving conditions for justice-involved women, they should focus on investing in community services and alternatives to incarceration that interrupt women’s distinct pathways to prison – not just building them newer, bigger, jails. With this year's updated edition of Mass Incarceration: The Whole Pie, we once again answer the essential questions of how many people are locked up, where, and why. The publication of the new report caps a year-long effort to update the public on the major drivers of incarceration – state prisons and local jails – as well as confined populations too often overlooked, such as people in post-release “civil commitment centers” and undocumented immigrants in detention. 76% of people in local jails are not convicted of a crime, and many are there simply because they can’t afford money bail. In a single year, 168,000 people were incarcerated for nothing more than a “technical violation” of probation or parole, such as a failed drug test. Contrary to a popular myth, only 7% of incarcerated people are held in privately-run facilities – but virtually all incarcerated people generate profit for private companies by paying for phone calls, medical care or other necessities. The United States locks up more people than any other country, at a rate more than five times higher than most other nations. One impediment to reform is the lack of available data to guide that conversation. In Whole Pie, the Prison Policy Initiative provides the comprehensive view of mass incarceration that society needs in order to plot a path forward. Mass Incarceration: The Whole Pie is one in a series of reports that provide equally comprehensive snapshots of women’s incarceration and youth confinement. Previous national reports from the Prison Policy Initiative include Following the Money of Mass Incarceration, which uses economic data to show who pays for and who benefits from mass incarceration, and Correctional Control, which breaks down the number of people in every state who are incarcerated, on probation, or on parole. The non-profit, non-partisan Prison Policy Initiative was founded in 2001 to expose the broader harm of mass criminalization and spark advocacy campaigns to create a more just society. The organization leads the nation’s fight to keep the prison system from exerting undue influence on the political process (via prison gerrymandering) and plays a leading role in protecting the families of incarcerated people from the predatory prison and jail telephone industry and the video calling industry. Tablet computers are delivering a captive audience to profit-seeking companies, while enabling prisons to cut essential services like law libraries. We investigate. But as with most state contracts that appear to cost nothing, there is a catch – several, in fact. First, the “free” tablets charge users at every opportunity, including above-market prices for phone calls, video chats and media. Even sending an email requires a paid “stamp.” Furthermore, our recent analysis of these contracts suggests that they actually put the interests of incarcerated people last, prioritizing cost savings and the provider’s bottom line. Guarantee the Department of Corrections a portion of tablet revenue. Allow tablet providers to alter the prices of services – such as email, music and money transfer – without state approval. Allow providers to terminate tablet services if the tablets aren’t profitable enough. Exempt providers from replacing a broken tablet if they think it was “willfully” damaged – a loophole ripe for exploitation, as prison tablets are cheaply made and break easily. Does the DOC receive a portion of tablet revenue? Can the provider cancel the service for reasons related to profitability? Will the provider replace broken tablets? Colorado DOC and GTL August 2015 (suspended in 2018) Yes. DOC earns a flat payment of $800,000 per year. Yes. GTL can cancel the service if there is insufficient tablet revenue, or if more than 10 tablets in any one housing unit need to be repaired. No, DOC does not have to approve the Terms and Conditions. GTL has discretion to determine whether damage was “willful,” and does not have to replace willfully damaged tablets. GTL also does not have to replace more than 5 (or 5%, whatever is greater) tablets in a housing unit every year. South Dakota DOC and GTL March 2018 Yes. DOC earns a 50% commission on electronic messages and 24.2% on most types of phone calls. Yes. GTL can cancel the service if there is insufficient revenue or if equipment is “subjected to recurring vandalism.” No, DOC does not have to approve the Terms and Conditions. GTL has discretion to determine whether damage was “willful,” and does not have to replace willfully damaged tablets. Indiana DOC and GTL July 2018 Yes, DOC earns a 10% commission on purchased content (not including phone or video calls made on tablets). Yes. GTL can cancel service in housing units where 10 or 10% of tablets are damaged in a year. Yes, DOC must approve the Terms and Conditions. GTL has discretion to determine whether damage was “willful,” and does not have to replace willfully damaged tablets. GTL does not have to replace tablets more than once for any given incarcerated person, nor does it have to replace more than 5 or 5% of tablets in a housing unit every year. Delaware DOC and GTL (pilot program) October 2018 No. Yes. GTL can cancel the service if too many tablets are damaged. Yes, DOC must approve Terms and Conditions. Unclear. Table 1. Findings from our analysis of eight “no-cost” contracts between state Departments of Corrections and tablet providers. Contracts are listed from oldest to newest. For more on GTL and Securus (JPay), the predominant tablet providers, see our recent report State of Phone Justice. In this table, “Active since” denotes the date that installation of tablet equipment in the correctional facility began. Law libraries. South Dakota eliminated its paralegals and physical law library after rolling out tablets. A subsequent lawsuit alleged that the tablet software meant to replace the law library is often unusable, and deprives incarcerated people of meaningful access to the courts. Physical books. Last year, Pennsylvania ended book donations to incarcerated people in favor of costly e-books, many of which were lifted directly from the free online library at Project Gutenberg. New York and Maryland also tried to end book donations (before public pressure forced them to backtrack), and one large Florida jail even took away Bibles, replacing them with low-quality e-Bibles on tablets. Postal mail, which prisons can eliminate in favor of digital mail scans (as Pennsylvania did) and paid electronic messaging. All this being said, there is nothing inherently wrong with tablet technology, in or out of a prison setting. It’s certainly possible to imagine using tablet technology to substantially improve prison life. But before states can write better contracts, they – and the public – must learn to distinguish truly innovative policies from high-tech ploys to cut costs. New report uncovers the cost of phone calls in over 1,800 locally-run jails across the U.S. The movement for phone justice has won huge victories in state-run prisons, but people in jail pretrial are on the front lines of exploitation. County and city jails frequently charge incarcerated people $1/minute or more for a phone call, far more than even the worst rates in state prisons, a new 50-state report finds. The Prison Policy Initiative report State of Phone Justice uncovers the cost of phone calls in over 1,800 jails nationwide, explaining why sheriffs sign lucrative phone contracts that prey on pretrial detainees. Phone providers compete for jail contracts by offering sheriffs large portions of the revenue – and then charge exorbitant phone rates. Providers exploit sheriffs’ lack of experience with telecommunications contracts to slip in hidden fees that fleece consumers. State legislators, regulators and governors pay little attention to jails, even as they continue to lower the cost of calls home from state prisons. A timeline showing how the two largest phone providers, Securus and GTL, are locking facilities into perpetual contracts by buying up their competitors. “If we’re going to tame the correctional phone market, we need sheriffs, state legislators, public utilities commissions and federal regulators to understand the significance of jail phone calls,” Wagner said. Phone providers are so creative in their influence-peddling that the most viable reform strategies do not focus only on "commissions." 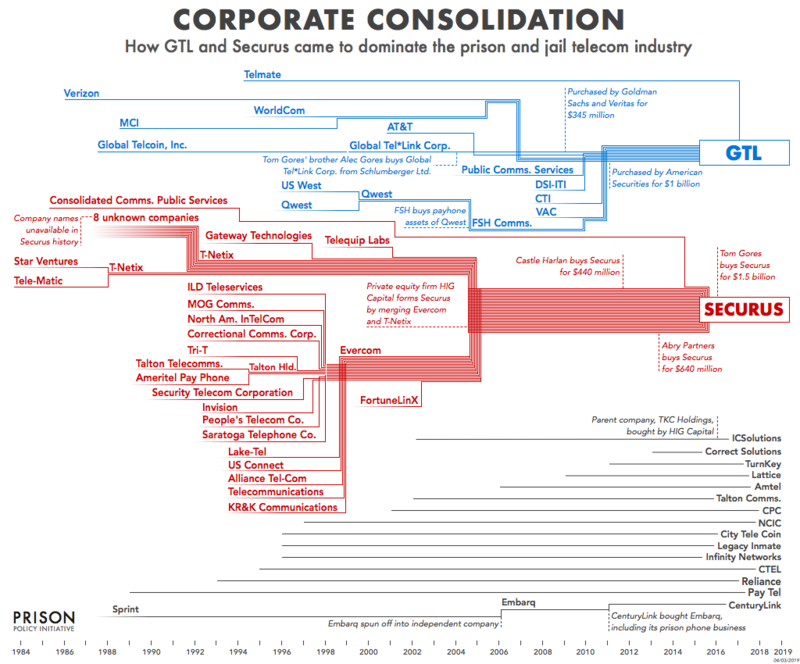 The prison and jail phone industry is rife with problems – from sky-high phone rates to inexplicable consumer fees to expensive and unnecessary “premium services” – and all of these problems can be traced to a single moment in the industry’s history: When the companies decided to start offering facilities a percentage of their revenue in order to win contracts. Before long, jails and prisons were prioritizing commissions over low rates when choosing a phone provider. This didn’t just saddle incarcerated people and their families with higher phone rates – it created two major problems for the companies, both of which have caused the market to spiral into dysfunction. The companies had painted themselves into a corner: How do you make a profit when you’ve given virtually all of your revenue away? Their solution: Find another source of revenue and hide it from the facility’s management. That’s why, today, prison and jail phone companies have learned to sustain themselves with revenue entirely separate from phone rates. The first of these hidden sources of revenue is consumer fees – fees to deposit money, open accounts, or get a refund. The most extreme – and telling – example so far of the prison phone market’s reliance on extra services comes from a provider named Smart Communications. This year, the Florida-based company began marketing to facilities on a promise of “100% phone commissions.” The catch should be obvious: The provider makes money by bundling other profitable services into the contract, and sharing none of this additional revenue with the facilities. Such extravagant promises reveal what providers have been doing all along: promising higher and higher commissions by relying more and more heavily on ancillary services and fees to boost profits. Gradually, the public has come to understand that there is an inherent conflict of interest when facilities award monopoly contracts and then reap a percentage of the revenue. As a result, the commission system started to fall out of favor. Some – though far from all – state legislatures started to prohibit percentage-based commissions. But legislatures left open a critical loophole: They didn’t prohibit companies from offering all improper perks to facilities – only commissions. Paying the facility a “signing bonus” for the contract. Providing phone-related technology, like cell-phone jamming equipment or call recording equipment. Providing computer equipment for corrections staff, law libraries and religious services. Paying exorbitant “rent” for the vendor’s equipment at a correctional facility. Making payments to influential sheriff-led associations (for another example, see page 10 of this document). In 2007, the County Commissioners of Dane County, Wisconsin voted to ban the commissions that brought in nearly $1 million per year. The County Supervisor explained, “We’ve lost our moral compass and direction for a million bucks a year.” But in 2009 the county negotiated a new contract where instead of taking a commission, it would just take an “administrative fee” of $476,000 in monthly increments. Consumers are getting a good price for phone calls and ancillary fees. The phone contract prohibits the provider from steering calls to more expensive methods. The contract does not include “free” products like tablets which are paid for through the sale of “premium” content. The contract specifically lists all rates, fees and charges. (It is unfortunately common for facilities to sign contracts without knowing what the provider is going to charge for ancillary fees, or for products that the providers label as “premium” or “convenience”. Cap commissions not as a percentage but as a fixed number of cents per minute, say 1 cent a minute. This approach maintains the problematic system of families subsidizing the correctional system, but is in improvement in that it gives the facilities an economic incentive to increase call volume and to monitor their provider for unnecessary fees and services that cut in to call revenue. See Prison phone provider accuses Florida Dept. of Corrections of using inmates’ families as a slush fund by Ben Conarck of the Florida Times-Union about how Florida “explicitly prohibited” contract bids that offered a percent commission, and then during negotiations demanded (and received from the winning bidder) a “wish list of goodies” instead of lower rates. Our August 1, 2013 letter arguing that the Federal Communications Commission should take an expensive view of “commissions.”” This letter was written when we still thought it practical to prohibit all commissions, but the detail in our letter reviews many of the most egregious examples of commissions packaged under other names. Our August 12, 2015 letter to the Federal Communications Commission with our investigation of the industry’s campaign contributions. We make the case that the FCC should focus on lowering the total cost of calls instead of chasing the infinite forms that commissions are taking. 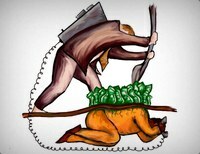 Our article about the prison phone industry’s new business model: “fee harvesting.” In this 2015 article, we explain why the providers focus on fees and why the facilities have a a real but short-sighted incentive to look the other way. The cost of jail phone calls punishes people in the most desperate circumstances, most of whom have not been convicted of a crime. It’s easy to see how people in state prison, who spend years or decades behind bars, are hurt by the cost of phone calls. But less obvious is how people in jail, who are usually behind bars for much shorter periods, can be hit even harder by the same cost. When people can’t get together the funds to get out of jail, exorbitant phone rates only make a difficult time even harder. Pretrial detention is an extremely stressful experience; detainees are often at risk of losing their jobs, housing, and even custody of their children. Being locked up, even for a short time, can interrupt medical care and can exacerbate mental health problems. It’s no coincidence that suicide risk is highest in the first week of jail incarceration. Calls with loved ones are essential for people under these conditions, who may need to coordinate childcare or elder care, make arrangements for missing work, have prescriptions brought to the facility, or simply have someone to talk to while incarcerated. Expensive phone calls further punish people in jails – most of whom, again, have not been convicted of a crime. People detained pretrial are more likely to plead guilty just to get out of jail, more likely to be convicted, and more likely to get longer sentences. Costly phone calls play a central role in this injustice by limiting how often and how long pretrial detainees can talk to their families and friends in the service of their defense. This makes it harder for defense attorneys to coordinate with family to build mitigation cases or track down witnesses. As a result, pretrial detainees often present a weaker defense than they would have if they had been able to make calls freely (or better, had not been detained in the first place). So jail phone companies (and jails themselves, which get kickbacks on these calls) are essentially subsidized by public defenders – and by extension, taxpayers – while public defenders are left with even fewer resources to help indigent clients. Ultimately, this, too, makes conviction more likely. But, wait, you might ask, if you’ve been paying attention to this issue: Didn’t the government solve this problem years ago? Didn’t the FCC limit how expensive phone calls from correctional facilities could be? Partly, yes: In 2014, the FCC set limits on rates for out-of-state calls from prisons and jails. But here too, unfortunately, people in jails get shortchanged. People in jails almost always make in-state calls, meaning that the FCC’s rate caps don’t apply to 92% of calls from jail. Instead of paying 21 cents or less per minute, as they would for out-of-state calls, people in jail calling loved ones in-state often still pay $1 per minute or more. The cost of these calls continues to get less attention from regulators, journalists and the public than it deserves. There’s an irony in that: When poor people in jail can’t afford to make phone calls, the fairness of the justice system is distorted – and everyone pays an outsized price.